Hello to all once again. David Katilius here with the second installment of my lesson series, Shred Guitar Fundamentals. In the last installment, I covered the background on shred guitar and showed you how to tremolo pick. Before I go on with this installment, I forgot to mention something important in my last installment, so I’m going to clear that up now. With any guitar exercise, whether it be chop building, technique, or speed and accuracy, you should always start out slowly. Now, I know you’re looking at me like “Dude, you can’t be serious!” It’s a known fact that people are driven towards anything with fast speed, just because of sensory perceptions of the human mind, a.k.a. basic instinct. I know it may seem tedious, but trust me, it pays off in the long run. Also, you should practice with a metronome. This is an extremely valuable and important tool if you want to start playing fast. Whether your metronome be a drum programmer or sequencer, a simple click track, or a $2.00 piece of crap from Wal-Mart, it’s vital nonetheless. In this installment, I’m going to discuss chromatics and intervals. 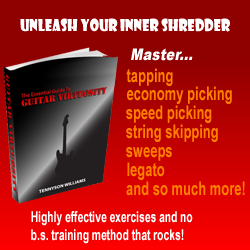 These are some of the most important exercises for all guitar players as well as shredders because they help improve the dexterity of the fret-hand fingers, and also develop coordination and synchronicity between the pick-hand and fret-hand. Most people practice them by using 4 notes per string on consecutive frets, meaning 1234, 2345, 3456, and so on. Here is a simple 2-octave chromatic scale in the key of A. Another thing that is useful to work on is intervals, which fall into the field of chromatics. A lot of these are like tongue-twisters for your fingers, the reason being that you have to pick your fingers up after some of the notes, which helps improve dexterity and coordination as I said earlier. There are 24 different combinations of intervals or chromatic variations, which I have listed below. Quite a bit of variations that you can work on. Mega helpful as well. I’ve included just a few in Power Tab format. By the way, I’m doing all my lessons in Power Tab format, so at the bottom of the page, you can download the files to your computer. If you don’t have Power Tab, get it. I highly recommend it. It’s very easy to use and it’s really neat as well. I’ve included the link at the bottom of the page if you want to download the program. That wraps it up for this installment. Next time, we’re going to get into alternate picking.